At the top of each Finder window is a toolbar. It’s visible all the time, unless you hide it by pressing command-option-T (this also hides the sidebar). By default, the toolbar contains a number of useful buttons, as well as the search field. Click on the back and forward buttons to navigate to folders you’ve visited recently, as in a Web browser. Click on any of the four View buttons to set your Finder view to Icon, List, Column, or Cover Flow view (see “Get the most out of Finder views” for more on views and when to use each). Click on the Action menu (labeled with a gear icon) to quickly create a new folder, make a file alias, move something to the Trash, and more. I find the Action menu particularly useful when I want to compress a file or folder. Click on the Path button to jump up to another folder in your hierarchy. Or click on the Quick Look button (labeled with an eye icon) to view the contents of a file, or to quickly turn a bunch of graphic files into a slide show. Customize the toolbar by choosing View -> Customize Toolbar. There are about a dozen buttons you can add for actions you might perform often, such as ejecting disks or getting information about files. 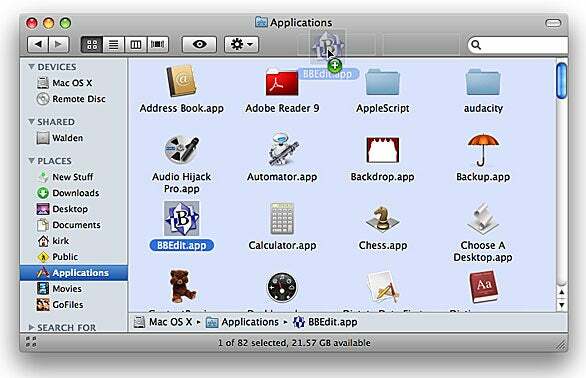 But that’s not all you can do to the toolbar—you can also add your favorite files, folders, or programs to it. Drag an item up to the toolbar to a position—say, to the right of the standard buttons—and then wait a second. The cursor will change to a green plus sign (+). Release the item or move it to a different location, and it will be added to the toolbar. Drag an often-used program's icon to the toolbar for quick access. When you view your files in Finder windows, it's quicker to drag one to a program icon here than to drag it all the way to the Dock. This is another good way to keep folders in a location that displays in all your Finder windows, or to put applications in a place where you can access them quickly. Once you’ve added an item to the toolbar, just click to open or launch the item; you can also drag files onto folder and application toolbar icons. If you have an application icon in the toolbar, you’ll probably have to drag your files a much shorter distance to reach that icon than to reach an icon on the Dock. You can change the size of toolbar icons, as well as whether their names display; you can even forgo icons in favor of text. Do this from the Customize Toolbar dialog box or by command-clicking on the button at the top right of the window. Keep clicking while holding down the command key to cycle through the six possibilities.